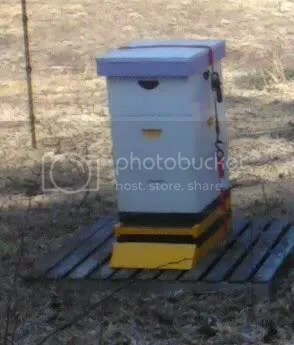 Promise to update soon as hives have been installed at all sorts of public locations, its spring, busy installing bees. Located at Middle Branch Farm, this second year hive is buzzing full with bees which will provide even greater pollination than a 1st year package or nuc, and was chosen for this location to fulfill the pollination demand. 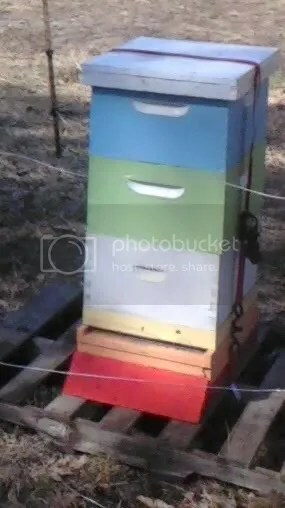 I brought the hive from my house, and so I’m now without bees but will start over with new bees when they are available next month as we miss them already. It has two full deep Langstroth boxes of foundationless built comb that the bees overwintered in over a third deep just added as they need the room to expand. The plan is to grow this into a monster hive for pollination and bee breeding. Another already grown Hive at Middle Branch farm, they need pollination. The electric fence is up and the hive is ratch-strapped down to a pallet; both for bear protection. This hive and others that will be placed here will provide pollination for the organic vegetables that Middle Branch Farm grows for its Community Supported Agriculture venture. Additionally only queens from years of no treatment practice, raised year round in this region are being used as I hope to start this as a breeding location to supply more local bees. So this particular hive will be kept very large with 4 deeps for the bees, honey above that. 4 deeps for the bees is 2.5-4 times commercial pollination size. In following springs 1.5 – 4.5 lbs of bees and the queen will be taken to start a new hive from his hive, with measures taken to have them start raising a new queen higher up before hand and born a day or two after the old queen has been taken to start a new hive. Additionally some queen cells or other virgin queens may come from this hive. For this year the hive is growing and pollinating.